Portable power tools for material processing have a long tradition at TRUMPF. 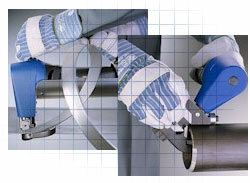 Back in the thirties already, TRUMPF developed the world's first hand-held electrical shears for cutting sheetmetal. These professional tools have been refined through the decades and evolved with modern technologies and new applications. All portable power tools from TRUMPF are precision machines with leading edge technology whose development is based on long years of experience. They facilitate daily tasks in the workshop or on construction sites.